Tecwyn Roberts, a key figure in the USA’s post-war space programme, was educated at Llanddaniel-fab’s village school, Ysgol Parc y Bont. He was born in 1925 at a house called Trefnant Bach, north east of the village. The school bought a wireless set while he was a pupil there. After studying at Beaumaris Grammar School, Tecwyn joined the staff of Saunders-Roe in Llanfaes, which had moved there from the Isle of Wight in 1941 to avoid German air raids. Flying boats imported from the USA were modified there for RAF use. After serving briefly with the RAF, Tecwyn returned to aircraft development. In 1959 he was recruited to the organisation which later became NASA (the National Aeronautics and Space Administration). He was its first flight dynamics officer (overseeing simulations of how spacecraft would fly) for Project Mercury, which developed the USA’s first manned space flights. Tecwyn played a key role in the design of the control centre at Cape Kennedy and the later centre at Houston. He was part of the team that landed the first humans on the moon in 1969. The first written record of “A-OK” – meaning perfect – is in a memo by Tecwyn in 1961. He paid a visit to Ysgol Parc y Bont in 1974, five years before he retired. 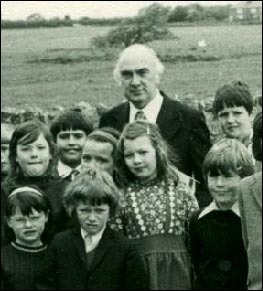 The photo shows him with some of the pupils. He died in 1988 and was buried at Crownsville, Maryland, USA. Ysgol Parc y Bont opened in 1874 in a new building by the river Braint, near Bryn Celli Ddu burial chamber. The building is now a children’s nursery. In 2001, the school relocated to its present building in the centre of the village. Inside is a memorial (previously in the village church) to Hugh Clifford Sewell-Cook, who was killed in action in Burma in the Second World War. He is also named on Llanddaniel-fab war memorial.